Form 2106-EZ cannot be priced separately from Form 2106 in Drake15. Drake15 does not include a separate pricing file for Form 2106-EZ. 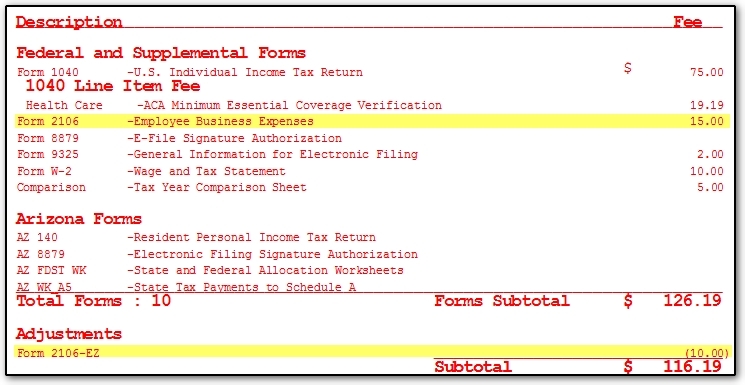 When the software produces Form 2106-EZ, it appears on the BILL priced as Form 2106. ​Drake16 and Drake17 do offer a separate pricing for both the 2106 and 2106-EZ form. Pricing can be set for these forms by going to Setup> Pricing. Form 2106 is form number 0175 and 2106-EZ is 0176. Form 2106-EZ is not available starting in Drake18.